Ouch! Stop pulling my hair! This books provides hidden insights about and understanding into one of karate's foundation kata--Sanchin. This book targets students who are studying to become a black belt, but at the same time it illustrates a path far behind this limited goal. Richard Kim was one of the most influential and best-loved 20th Century martial artists. "This exercise loosens up and stretches the muscles surrounding the hip joints. 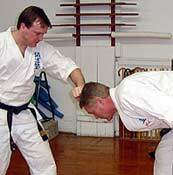 Practicing it regularly will promote higher, faster and more powerful kicks. The true meaning of kata has been neglected and it is critical that it be rediscoved.